Today’s article discusses the most famous muslim scientists and inventors and their wonderful inventions. Abu Nasr Muhammad al-Farabi was one the earliest Islamic intellectuals who was instrumental in transmitting the doctrines of Plato and Aristotle to the Muslim world. 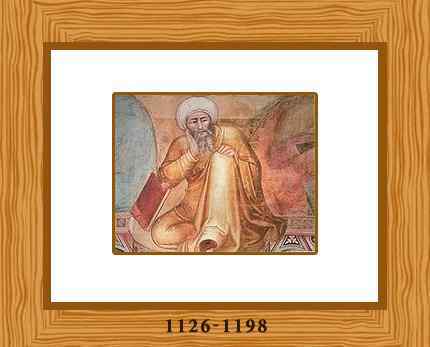 He had a considerable influence on the later Islamic philosophers such as Avicenna. He was an outstanding linguist who translated the Greek works of Aristotle and Plato and made considerable additions to them of his own. He earned the nickname Mallim-e-Sani, which is translated as “second master” or “second teacher”. Also popularly known as ‘Avicenna’, Ibn Sina was indeed a true polymath with his contributions ranging from medicine, psychology and pharmacology to geology, physics, astronomy, chemistry and philosophy. He was also a poet, an Islamic scholar and theologian.His most important contribution to medical science was his famous book Al Qanun Fi Al-Tibb (The Canon of Medicine). This book is an immense five volume encyclopedia of medicine containing over a million words. It comprises of medical knowledge available from ancient and Muslim sources. His other major work is “The Book of Healing”, a scientific and philosophical encyclopedia. This great scientist was born in around 980 A.D in the village of Afshana, near Bukhara, now in Uzbekistan, which is also his mother’s hometown. His father, Abdullah an advocate of the Ismaili sect, was from Balkh which is now a part of Afghanistan. Ibn Sina received his early education in his home town and by the age of ten he became a Quran Hafiz (he had memorized the Quran). He had exceptional intellectual skills which enabled him to overtake his teachers at the age of fourteen. During the next few years he devoted himself to Muslim jurisprudence, philosophy and natural science and studied logic, Euclid, and Ptolemy’s Almagest. Ibn Sina was an extremely religious man. When he was still young, Ibn Sina was highly baffled by the work of Aristotle on metaphysics so much so that he would pray to God to guide him. Finally after reading a manual by a famous philosopher al-Farabi, he found the solutions to his difficulties. At the age of sixteen he dedicated all his efforts to learn medicine and by the time he was eighteen gained the status of a reputed physician. During this time he cured Nuh II, Ruler of the Samanids, of an illness in which all the renowned physicians had given up hope. On this great effort, the Amir wished to reward him, and the young physician requested consent to use his exclusively stocked royal library. On his father’s death, when Ibn Sina was twenty-two years old, he moved to Jurjan near the Caspian Sea where he lectured on logic and astronomy. Here he also met his famous contemporary Abu Rayhan al-Biruni. Later he travelled to Rey and then to Hamadan (both in present day Iran), where he wrote and taught his works. Here he also cured Shams al-Dawla, the Emir of Hamadan, from a severe illness. From Hamadan, he moved to Isfahan (now in central Iran), where he finished his epic writings. Nevertheless, he continued to travel and too much mental exertion as well as political chaos affected his health. The last decade or so of his life, he spent in the service of a military commander Ala al-Dawla Muhammad. He served him as a physician and general literary and scientific consultant, including during his campaigns. He died during June 1037 A.D, aged 58 and was buried in Hamedan, Iran. Avicenna’s most important contribution to medical science was his famous book Al Qanun Fi Al-Tibb (The Canon of Medicine), known as the “Canon” in the West. This book was an immense five volume encyclopedia of medicine including over a million words. It comprised of medical knowledge available from ancient and Muslim sources. This book was translated into Latin in the twelfth century and was used as the standard medical text in European universities until the mid-seventeenth century. His other major work was “The Book of Healing”, a scientific and philosophical encyclopedia. This book was intended to ‘heal’ the soul. It was split into four parts: logic, natural sciences, mathematics and metaphysics. In his book, he developed his own system of logic, Avicennian logic. In astronomy, he proposed that Venus was closer to the Sun than the Earth. He invented an instrument for observing the coordinates of a star. He made several astronomical observations and stated that the stars were self-luminous. 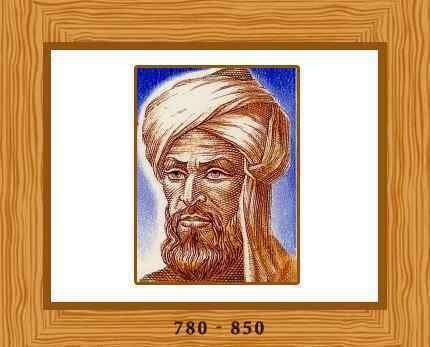 In mathematics, Avicenna explained the arithmetical concept and application of the “casting out of nines”. Ibn Sina also contributed to poetry, religion and music. In total, Avicenna wrote over 400 works, of which around 240 have survived. After the completion of the Rihla in 1355, little is known about Ibn Battuta’s life. 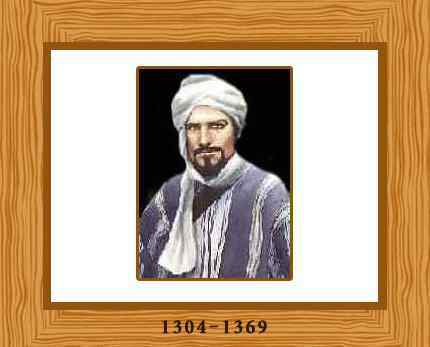 He was appointed a judge in Morocco and died in 1368. Nevertheless, the Rihla provides an important account of many areas of the world in the 14th century. His thought is genuinely creative and highly controversial, producing powerful arguments that were to puzzle his philosophical successors in the Jewish and Christian worlds. He seems to argue that there are two forms of truth, a religious form and a philosophical form, and that it does not matter if they point in different directions. He also appears to be doubtful about the possibility of personal immortality or of Gods being able to know that particular events have taken place. There is much in his work also which suggests that religion is inferior to philosophy as a means of attaining knowledge, and that the understanding of religion which ordinary believers can have is very different and impoverished when compared with that available to the philosopher. Ibn Rushd died in Marakesh in 1198 where he was buried. Three months later, his body was moved to Qurtuba, the tribune of his thought. It leaves no room for any doubt about the important influence that the Muslim Philosopher had on the greatest of all Catholic theologians. His most recognized work as mentioned above and one that is so named after him is the mathematical concept Algorithm. The modern meaning of the word relates to a specific practice for solving a particular problem. Today, people use algorithms to do addition and long division, principles that are found in Al-Khwarizmi’s text written about 1200 years ago. Al-Khwarizmi was also responsible for introducing the Arabic numbers to the West, setting in motion a process that led to the use of the nine Arabic numerals, together with the zero sign. 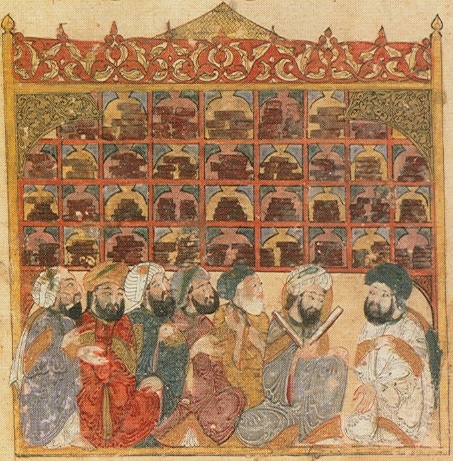 Muhammad ibn Musa al-Khwarizmi died in c. 850 being remembered as one of the most seminal scientific minds of early Islamic culture. In the year 1072 AD, Omar Khayyam documented the most accurate year length ever calculated – a figure still accurate enough for most purposes in the modern world. Khayyam was an astronomer, astrologer, physician, philosopher, and mathematician: he made outstanding contributions in algebra. His poetry is better known in the West than any other non-Western poet. The man himself remains something of an enigma. Different biographers have documented him as a fun-loving, wine-drinking agnostic; a closet Zoroastrian; a Sufi Muslim; an orthodox Sunni Moslem; and a follower of Ancient Greek philosophy. All agree that he was an outstanding intellectual. Omar Khayyam was born on May 18, 1048 in the great trading city of Nishapur in northern Persia. Today the city is in Iran. Omar’s father was Ebrahim Khayyami, a wealthy physician. Omar’s mother’s name is not known. Some authors have written that Omar’s father earned a living making tents, because Khayyami means tent-maker. However, although many English-speakers are named Smith, it does not mean their fathers spend their days hammering hot metal on an anvil. Omar’s family were Muslims. His father seems to have been relaxed about religion, employing a mathematician by the name of Bahmanyar bin Marzban, a devotee of the ancient Persian religion of Zoroastrianism, to tutor Omar. 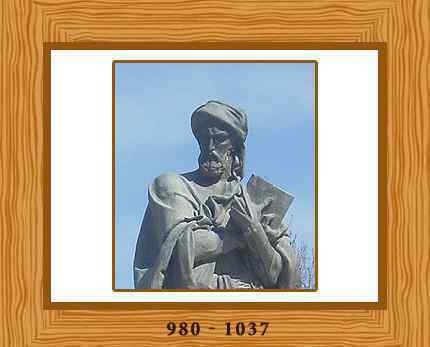 Bahmanyar had been a student of the great physician, scientist, and philosopher Avicenna, and he gave Omar a thorough education in science, philosophy, and mathematics. 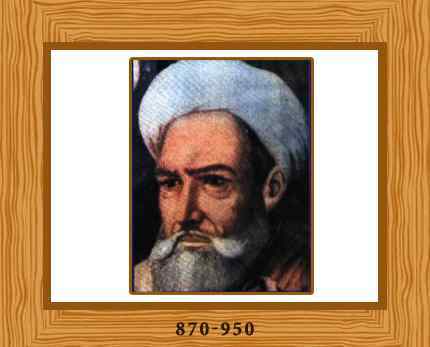 Khawjah al-Anbari taught Omar astronomy, guiding him through Ptolemy’s Almagest. 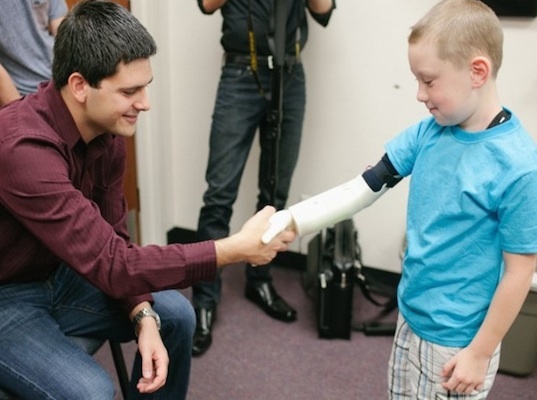 In his early teens Omar worked in his fathers’ surgery learning about medicine. Omar Khayyam celebrated his eighteenth birthday in 1066. In that same year, Halley’s comet appeared in the heavens, William the Conqueror’s Norman Army invaded England, and Omar’s father Ebrahim died. A few months after Ebrahim’s death, Omar’s tutor Bahmanyar also died. It was the end of an era in Omar Khayyam’s life. It was time to put his family’s affairs in order and move on. Omar Khayyam joined one of the regular caravans making a three month journey from Nishapur to the great city of Samarkand, which is now in Uzbekistan. Samarkand was a center of scholarship, and Khayyam arrived there probably in 1068, aged 20. In Samarkand he made contact with his father’s old friend Abu Tahir, who was governor and chief judge of the city. Tahir, observing Khayyam’s extraordinary talent with numbers, gave him a job in his office. Soon Khayyam was given a job in the king’s treasury. While living in Samarkand, Khayyam made a major advance in algebra. At high school, we learn about equations of the form ax2 + bx + c = 0; these are called quadratic equations. Cubic equations are of the form ax3 + bx2 + cx + d = 0. Naturally, cubic equations are harder to solve than quadratics. 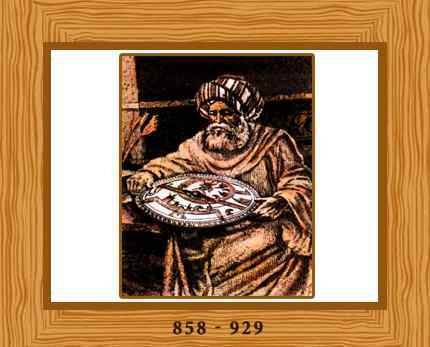 Khayyam conjectured correctly that it is not possible to solve cubic equations using the traditional Ancient Greek geometrical tools of straightedge and compass. Other methods are required. At the age of 22, in 1070, Khayyam published one of his greatest works: Treatise on Demonstration of Problems of Algebra and Balancing. In it he showed that a cubic equation can have more than one solution. He also showed how the intersections of conic sections such as parabolas and circles can be utilized to yield geometric solutions of cubic equations. Archimedes had actually started work in this field over a thousand years earlier, when he considered the specific problem of finding the ratio of the volume of one part of a sphere to another. Khayyam considered the problem in a more general, methodical way. Although Khayyam’s achievement was magnificent, he was personally disappointed that he needed to utilize geometry to solve cubic equations – he had hoped to discover an algorithm using only algebra. Treatise on Demonstration of Problems of Algebra and Balancing established Khayyam as a mathematician of the first rank, and his reputation spread quickly throughout Persia. Following Khayyam’s work there was little significant progress on cubic equations until, in 1535, Niccolo Tartaglia found general solutions for all cubic equations. Khayyam wrote: What is the amount of a square so that when 6 dirhams are added to it, it becomes equal to five roots of that square? Algebra and Geometry were successfully linked by Pierre de Fermat and René Descartes in the 1600s, resulting in the modern x-y coordinate system. Whoever thinks algebra is a trick in obtaining unknowns has thought it in vain. No attention should be paid to the fact that algebra and geometry are different in appearance. Algebras are geometric facts which are proved by Propositions 5 and 6 of Book 2 of Euclid’s Elements. In 1073, Khayyam received an invitation to the Persian city of Isfahan, capital of the Seljuk Empire, to prepare a calendar that would work in an orderly way and be accurate forever – this was an era in which year lengths were regularly changed. Khayyam’s invitation came from the two most powerful men in the Seljuk Empire, of which Persia was part: these were Malik Shah, Sultan of the Great Seljuq Empire, and Nizam al-Mulk, his vizier. Khayyam recruited other talented scientists to accompany him to Isfahan in 1074. There he was paid an extraordinarily high salary and enjoyed a privileged lifestyle. Malik Shah paid Khayyam to found an observatory with an initial aim of making observations of the heavens for 30 years, during which time Saturn, the most distant planet then known, would complete an orbit. 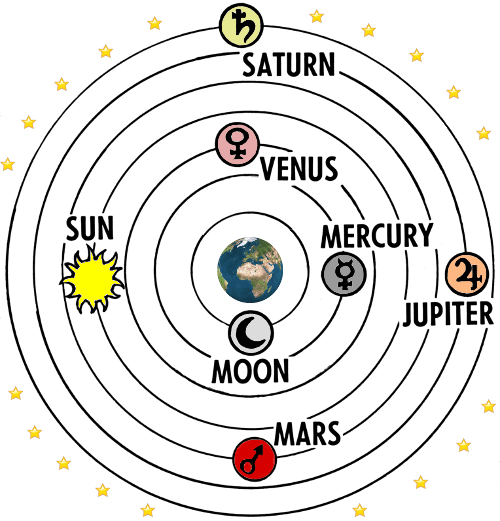 Ptolemy’s universe – the model accepted by Omar Khayyam. During his time in Isfahan, Khayyam measured the length of a year – to be specific the tropical year length – with remarkable accuracy and precision. Khayyam found that 1,029,983 days made 2,820 years. This gives a tropical year length of 365.2422 days to seven significant figures. Although it has become fashionable to quote more decimal places than this, Khayyam’s input of 1,029,983 days contains seven significant figures, so it is unreasonable to quote more than this number of significant figures in the calculated year length. Today we know that the length of a tropical year actually changes by as much as 30 minutes from year to year. The average tropical year length quoted today is 365.242189 days, which to seven significant figures is 365.2422 days – exactly the figure Khayyam arrived at almost a thousand years ago. The length of a tropical year is also increasing very slightly as time passes, although not enough between Khayyam’s era and our own to be noticeable on a scale of seven significant figures. Malik Shah introduced Khayyam’s new calendar in the Seljuk Empire on March 15, 1079. It was used until the 20th century. The 13 books of Euclid’s Elements published in about 300 BC were probably the most influential books in the entire history of mathematics. The Elements had been built on five geometric postulates – in other words five things that were assumed to be true about geometry: for example, all right angles are equal to one another. 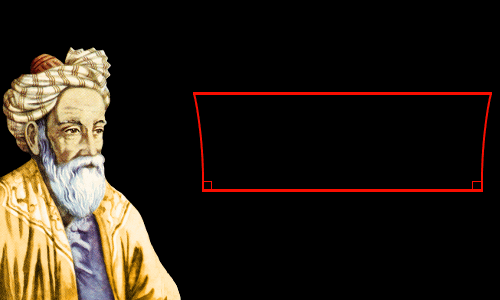 Euclid had considered a straight line crossing two other straight lines. He looked at the situation when the interior angles (shown in the image below) add to less than 180 degrees. In these circumstances, he said that the two straight lines will eventually meet on the side of the two angles that add to less than 180 degrees. Since almost the day Elements was published, mathematicians had been trying to use Euclid’s first four postulates to prove the parallel postulate. They were doomed to fail. We now know that it is impossible to prove the parallel postulate using Euclid’s other postulates. 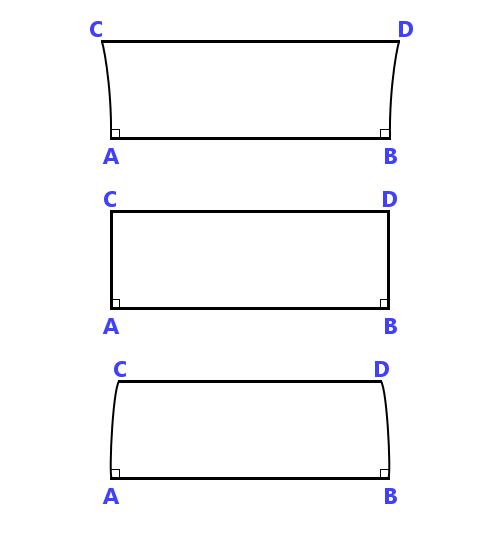 He then refutes the possibility that angles C and/or D can be anything other than right-angles and in the image above only the central option is possible. So, he believes he has proven the parallel postulate. In fact, he has not done so, all he has done is stated it in a different way. What is interesting to historians of mathematics is that in Khayyam’s ideas – shown roughly in the images above – they can see the first glimmers of non-Euclidean geometry. Full details of Khayyam’s personal life are not known. He is believed to have married and had at least one son and one daughter. In 1092, Malik Shah and his vizier both died – the first probably by poisoning, the second by assassination. Khayyam went into hiding during the resulting power struggle. His survival depended on lying low. He had been Malik Shah’s personal physician and become his close personal friend – which had made him enemies – and Khayyam’s poetry suggests his behavior may not have been devoutly religious – and this had also made him enemies. Khayyam actually published no poetry in his lifetime. Some of his musings would potentially have endangered his life. Tis better all my thoughts remain unsaid. Omar Khayyam died at the age of 83 in his hometown of Nishapur on December 4, 1131. He was buried in a tomb whose location he had chosen in an orchard where blossom would fall twice a year.